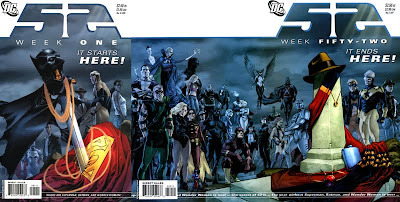 The Billionty-Oneth Geek: DC's Fifty-Two!!! When I was a youngster, Marvel Comics was always my favourite company between them and DC Comics. Marvel just always seemed to have cooler and flashier heroes. DC on the otherhand always seemed oldschool and bland by comparison. Amongst me and my friends, Marvel was always the cool and hip brand. Now that I'm older, I'm really re-evaluating that preference. What reasons do I have to like Marvel? Nothing that I've read in the past few years have really grasped me, in fact, I've felt more disappointed if anything. DC on the otherhand seems to produce more content that I can really connect with and if you count their Vertigo imprint as DC, then by far, DC would be my favourite right now. But I'm going to be fair to Marvel and discount Vertigo. I just get excited reading DC stories now. Not only are the stories well written and gripping, I get excited in discovering new characters that I never knew about before, who are just as cool as those from Marvel. Okay, I just had to get that out of my system. DC's Fifty-Two is the follow-up series that started right as Infinite Crisis concluded. It was a weekly series that began in May of 2006, that concluded the following year (hence Fifty-Two, one for each week). The premise behind Fifty-Two was to show how the DC Universe existed while Superman, Wonder Woman and Batman took a one year sabbatical. Just how would the world cope without it's trinity of superheroes? The series has many story arcs within itself, at different times focusing on different heroes or villains. One of the more interesting stories followed a project created by Lex Luthor called the “Everyman Project”. Luthor discovers a way to give civilians super powers, thus turning them into superheroes and so “everyman” can be a hero. He gives every willing person a chance to become a hero. To the public, his intentions seem good, that is until a few heroes discover his true ploy. Probably my favourite arc involved a superhero named Booster Gold. Booster is a superhero who tries to exploit his superhero status for fame and fortune. When its discovered that he’s a fraud, he begins on a journey of redemption. It’s probably my favourite story because I can’t help but feel like I’d do the same sorts of things if I were a superhero. I would selfishly want that fame and fortune, fail, and begin my own journey of redemption. It’s the classic three act story! The series was scribed by an all-star cast of writers including Geoff Johns, Grant Morrison, Greg Rucka and Mark Waid. Because each issue was released in such a short time frame, a plethora of artists worked on the art. Sometimes the art was a hit and unfortunately, other times a miss. Still, I had fun reading the entire series, it never skipped a beat. This was a fun follow-up to Infinite Crisis and worth checking out. Later geeks! © The Billionty-Oneth Geek. Design by The Lam. That's right, me.